Multiple hooks and stretchable cords make this cargo net easy to use, even on roof-mounted cargo carriers. Fits Curt cargo basket with extension (C18115 and C18117). Call 800-298-8924 to order Curt cargo nets part number C18201 or order online at etrailer.com. Free expert support on all Curt products. Guaranteed Lowest Price and Fastest Shipping for Curt Stretchable Cargo Net - 38" Wide x 65" Long. Cargo Nets reviews from real customers. Multiple hooks and stretchable cords make this cargo net easy to use, even on roof-mounted cargo carriers. Fits Curt cargo basket with extension (C18115 and C18117). 18201 Curt Cargo Net - 38" x 65"
ProGrip Cargo Net for Mid-Size Truck Beds - 60" x 46"
The Spidy Gear Bed Webb truck bed cargo net is designed to secure even and uneven loads alike. Constructed of heavy-duty stretch shock cord, this cargo net is easy to install and fits all mid-size truck beds. Secure the cargo in your long-bed pickup truck with this heavy-duty polyester net. 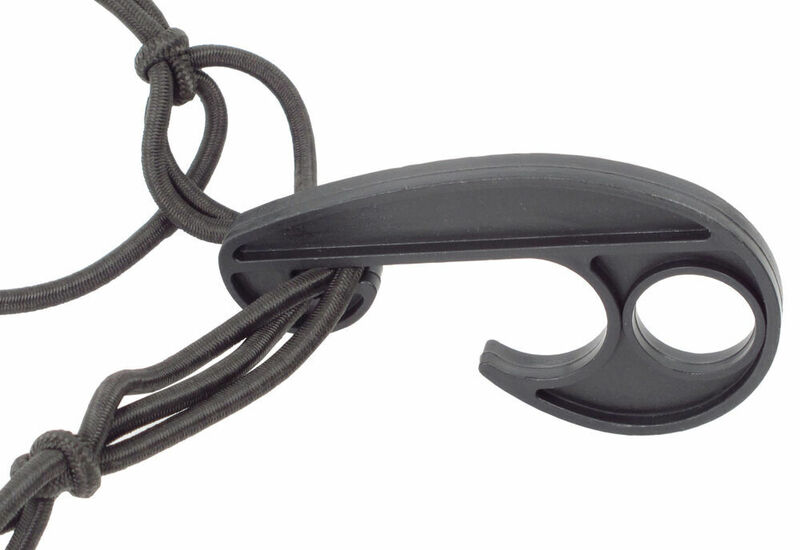 Includes 6 cam-buckle straps that hook to 14 integrated steel D-rings for easy attachment to your truck. 2,200 Max load. Rola Flat Strap Cargo Net 36" x 48"
Thule Cargo Net with Storage Bag, 40" x 36"
Stretchable Cargo Net for Rhino-Rack Steel Mesh Cargo Basket - 47-1/5" x 31-1/2"
Cargo Net for SportRack Hitch Mounted Cargo Carrier - 60" x 20"
Stretchable Net and Tie-Down Straps for Rhino-Rack Roof Cargo Basket - 47-1/5" x 31-1/2"
Spider Cargo Net for Kuat Vagabond and Vagabond X Roof Cargo Baskets - 41" x 34"
Rightline Gear Sport 3 Rooftop Cargo Bag - Waterproof - 18 cu ft - 48" x 40" x 19"
Rhino-Rack Rooftop Cargo Bag - Waterproof - 17.5 cu ft - 59" x 43" x 11-1/2"
Hey guys, Matt here at etrailer.com. Today we're going to be going over the Curt Stretchable Cargo Net, 38" wide by 65" long, part number C18201. 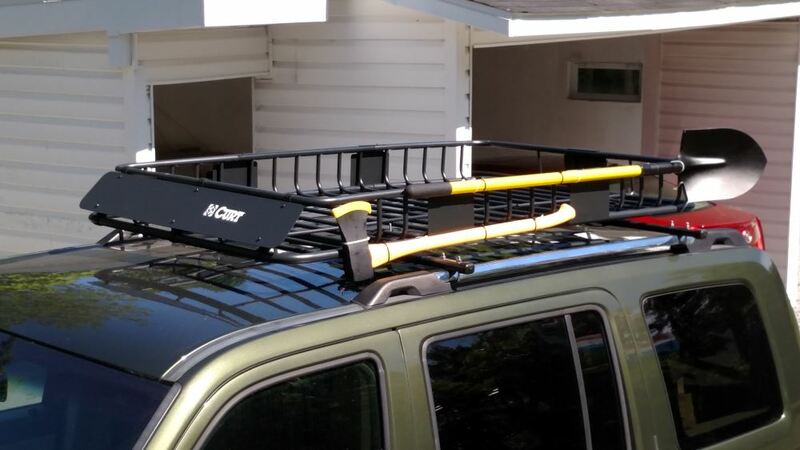 This stretchable cargo net is a great way to secure your gear in, like you can see here, a rooftop cargo basket, maybe a hitch mounted cargo carrier, or even just the bed of your truck. You can see that this cargo net perfectly fits our 62-1/2" Long Curt Roof Mounted Cargo Basket with the extension, which is what we have here. A couple of neat things about this Curt Stretchable Cargo Net you can see it's really elastic. Another neat thing about this cargo net is the unique hooks that are on the net. You can see there's this hole right here, which allows you to just quickly pop it off and continue to undo the net, or if you're going around your gear just pull it down and snap it in place. The opening of the hook is perfectly designed for the rails of this carrier. You can see that they snap in place and pull there, so maybe you have one hook that doesn't have a lot of pressure on it, it's not going to come unhooked and just be flapping around in the wind when you're going down the road. 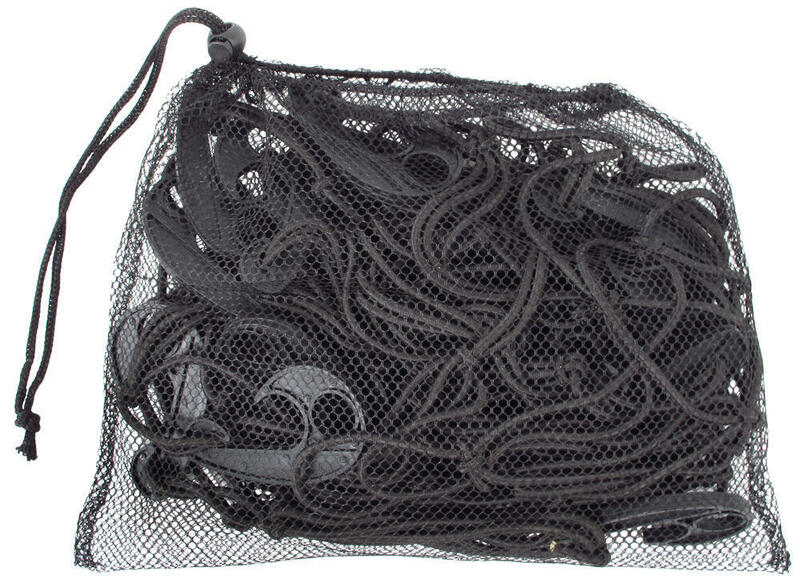 This cargo net measures 38" wide by 65" long and comes with a one year warranty. Now that we've got our gear all loaded up and secure, we'll go ahead and take it out on the highway to show you how it performs. That'll complete today's review of the Curt Stretchable Cargo Net part number C18201. .
Order: RelevanceNewestRating - High to LowRating - Low to High Multiple hooks and stretchable cords make this cargo net easy to use, even on roof-mounted cargo carriers. Fits Curt cargo basket with extension (C18115 and C18117). We have made a few 600-800 mile road trips with our 6 person family in our Tesla Model X and we love the aluminum rack, waterproof bag, super cool tie down straps and especially the hitch lock. Onlookers have come up to me on our trips and asked about my setup and I tell them how flexible it is in handling varying load sizes and when I am not using it, the compact storage. You should list my setup as a package recommendation on your website.I really couldnt be happier with everything. Do you have a question about this Cargo Net? I reached out to my contact at Kuat and the Spider Cargo Net for Kuat Vagabond and Vagabond X Roof Cargo Baskets - 41" x 34" # ANET0B is only large enough for use without the extender. With the Kuat Vagabond X # VX201 along with the 21 inch Xtender # VX202 give you overall dimensions of 73" long x 41" wide x 7" tall. For this application, I recommend the Curt Stretchable Cargo Net - 38" Wide x 65" Long # C18201. 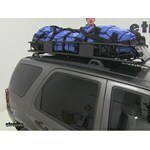 The Erickson Roof-Rack Cargo Net part # EM01010 is 36 by 48 inches. The Curt Cargo Net # C18201 is 38 by 65 inches. Curt Cargo Carrier part # C18202 is 20 by 60 inches. The Stretch Net for Yakima MegaWarrior # Y07081 is 45 by 38 inches. The Curt Cargo Net part # C18200 is 38 by 44 inches. When laid out flat, the Rola Cargo Net measures 36 by 48 inches. When the extension is added to the basket, it will be 70 inches long, too long for the net to stretch. The Curt Stretchable Cargo Net, part # C18201 would be a better choice for you. 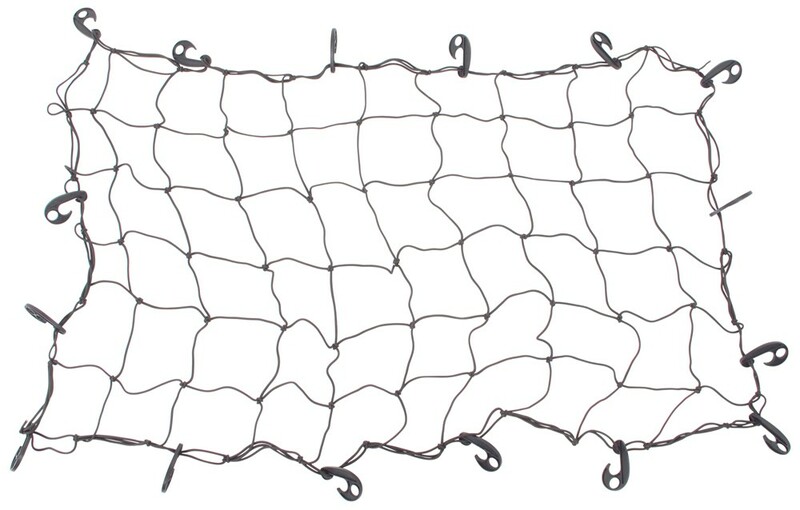 At 38 by 65 inches, the net will provide plenty of stretch to accommodate your cargo. You might also want to consider a wheel step like part # TH2100 which would make accessing your rooftop cargo much easier, not to mention safer. It would be a tight fit but based on the dimensions of the Malone cargo box # MPG911 and your 33 x 29 x 12 inch boxes I believe you could get them to fit in the box. Another option is to use a roof basket, # Y07080-82, and a cargo net, # C18201. A basket will be easier to store since it won't take up as much space. A box though can be locked so there are advantages to either option. I went out to the warehouse and pulled Curt cargo net # C18201 to measure the hook openings. There is also a hole in the hooks so I measured it as well. The hole is 0.72 inches in diameter. And the hook opening is 0.93 inches wide. Even if the hooks are not the exact right size you could still wrap them around the bars and then attach the hooks to the net part. Basically you would be tieing it off to itself in this case. Yes! 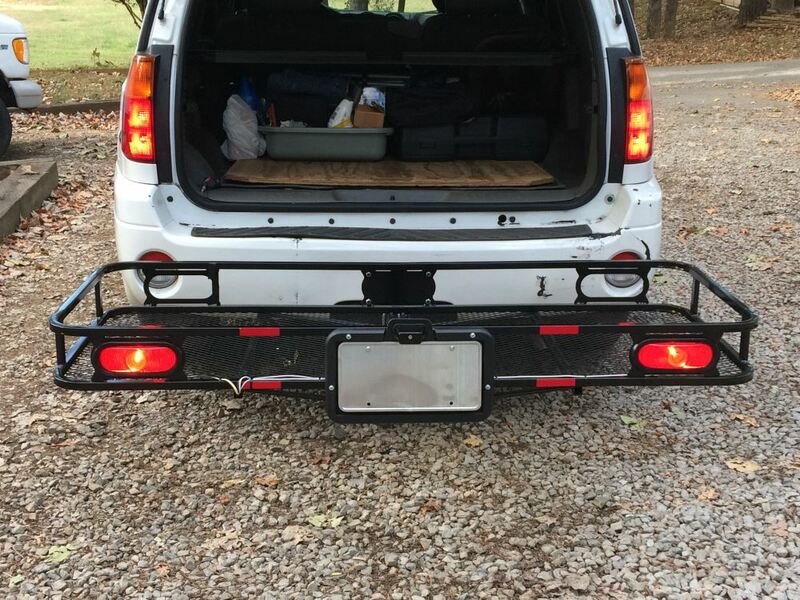 I checked with Yakima and the MegaWarrior Extra Large Roof Rack Cargo Basket and Extension # Y07080-82 will fit the factory roof rack on your 2015 GMC Yukon. I have linked a video review featuring this product for you. Highest quality cargo nets for the best price. Most detailed, accurate cargo net information available.